Years ago, homeowners had a choice of either gas or electric ranges. This either/or situation created some heated debate as to which was best. Gas fans proclaimed the fuel is better at controlling burner heat and electric proponents asserted these ovens maintained heat more consistently, and therefore, were better for baking and roasting. Manufacturers took this debate under consideration and today offer dual-fuel options—gas stovetop combined with electric oven. The combination is ideal for those who are super serious about their kitchen creations. However, gas-only ranges are still a popular choice among consumers. Because these appliances can run anywhere from several hundred dollars into thousands of dollars, it’s important to read a few gas range reviews before going shopping. The standard size is 30 inches, and most older kitchens allot for this dimension. Newly built kitchens or recent remodels may accommodate larger, high-end ranges. Another standard feature are four burners; however, newer versions may have five or more. One burner should be designated high-powered, meaning it’s designed for quick heating. Two of the other burners should be medium size and the fourth is typically smaller. Chef’s stoves or commercial models often include eight or more burners. Traditionally, the flame or heat power is managed by knobs, but over time, manufacturers have replaced them with touch pads or screens. Some of the newest versions have “disappearing” screens where the information comes up with a touch and disappears after a given amount of idle time has lapsed. This is almost an afterthought because all stoves offer different oven rack heights. Serious bakers, though, should check out the settings to make sure they are to your liking. Bakers appreciate the space and efficiency that come with a double oven. What’s more, these can be more energy efficient than traditional ovens because the usually smaller second oven requires less energy to heat up. Baking drawers are designed to do just that: bake. Warming drawers do not get hot enough to cook food, but they do keep it warm. If you want this convenience, then make sure the oven door has a locking device as the cleaning cycle requires temperatures to reach between 900 and 1,000 degrees Fahrenheit. Now that you know what to look for when doing your gas range reviews, start looking at what your money will buy you. What doesn’t this model feature? 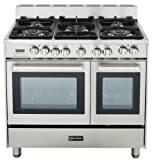 Made from 304 stainless steel, it offers cooks upscale cooking control with cast-iron grates, infrared broiler in each oven, five sealed burners and a griddle option. Aesthetically, owners will appreciate its sleek design with chrome knobs and handles. This LG range has received the Good Housekeeping Seal, one of the top honors for consumer products. Double ovens mean the range can pull double duty, at different temperatures if necessary. Plus, the EvenJet Convection System speeds up preheating, so the ovens are good to go in minutes. Although this design looks basic, its offers a variety of features. The low-simmer burner is perfect for melting butter or cooking heat-sensitive sauces. The timed-cook option initiates preheating so the oven’s waiting for you and not the other way around. The large oven window enables you to check on food without opening the door and letting out any heat.